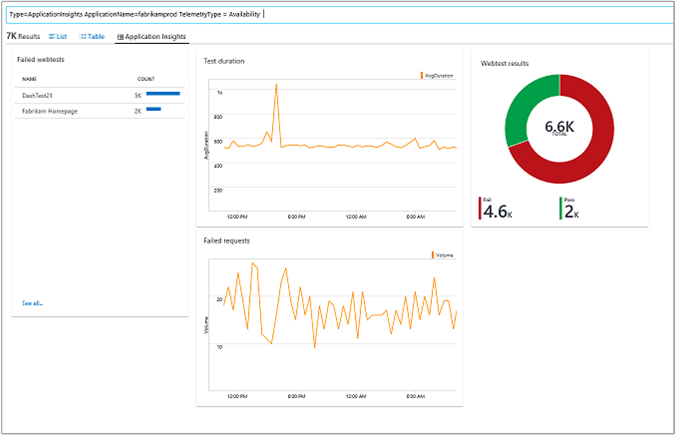 With the support of cross-resource queries, the Application Insights Connector management solution is no longer required. It has been deprecated and removed from Azure Marketplace, along with the OMS portal that was officially deprecated on January 15, 2019 for Azure commercial cloud. It will be retired on March 30, 2019 for Azure US Government cloud. Existing connections will continue to work until June 30, 2019. With OMS portal deprecation, there is no way to configure and remove existing connections from the portal. See Removing the connector with PowerShell below for a script on using PowerShell to remove existing connections. 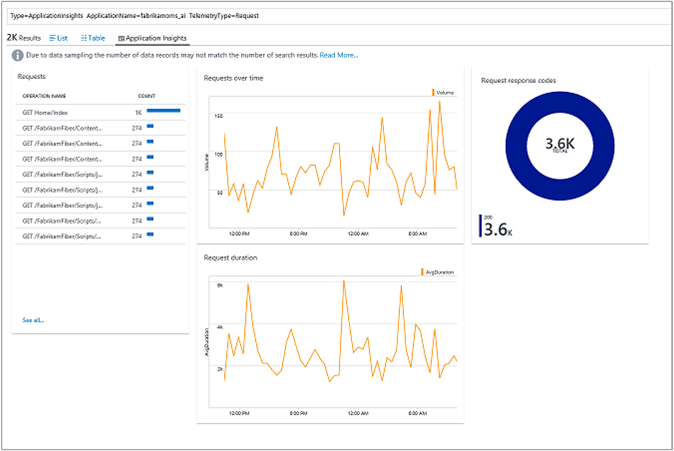 For guidance on querying Application Insights log data for multiple applications, see Unify multiple Azure Monitor Application Insights resources. For more information on the OMS portal deprecation, see OMS portal moving to Azure. 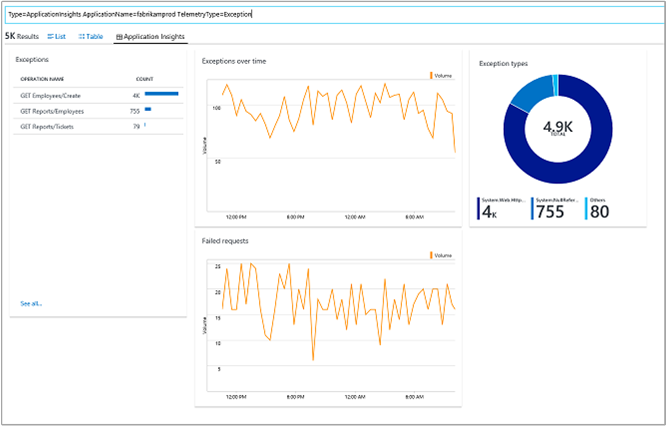 The Applications Insights Connector solution helps you diagnose performance issues and understand what users do with your app when it is monitored with Application Insights. Views of the same application telemetry that developers see in Application Insights are available in Log Analytics. However, when you integrate your Application Insights apps with Log Analytics, visibility of your applications is increased by having operation and application data in one place. Having the same views helps you to collaborate with your app developers. The common views can help reduce the time to detect and resolve both application and platform issues. Unlike most other Log Analytics solutions, data isn't collected for the Application Insights Connector by agents. All data used by the solution comes directly from Azure. Windows agents No The solution does not collect information from Windows agents. Linux agents No The solution does not collect information from Linux agents. SCOM management group No The solution does not collect information from agents in a connected SCOM management group. Azure storage account No The solution does not collection information from Azure storage. You must have at least one configured Application Insights resource. 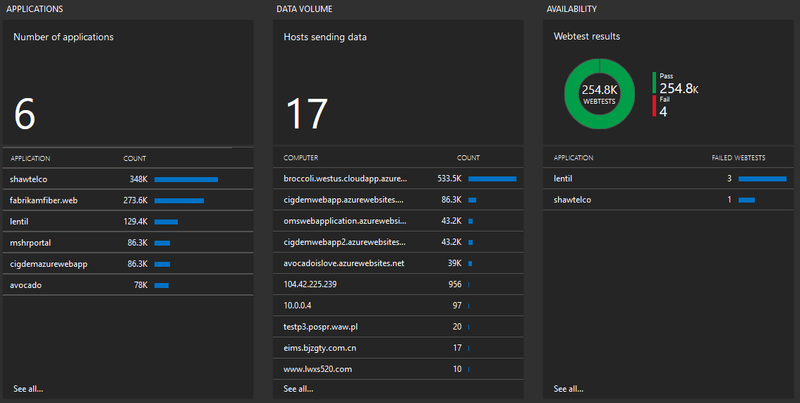 Enable the Azure Web Apps Analytics solution from the Azure marketplace or by using the process described in Add Log Analytics solutions from the Solutions Gallery. Browse to the Azure portal. Select All services to open Application Insights. Then, search for Application Insights. Under Subscriptions, select a subscription that has Application Insights resources and then under Name, select one or more applications. You can only link Application Insights apps to one Log Analytics workspace. You can only link Basic or Enterprise Application Insights resources to Log Analytics. However, you can use the Free tier of Log Analytics. This solution does not install any management packs in connected management groups. The following sections describe how you can use the blades shown in the Application Insights dashboard to view and interact with data from your apps. Click the Application Insights tile to open the Application Insights dashboard to see the following blades. The dashboard includes the blades shown in the table. Each blade lists up to 10 items matching that blade's criteria for the specified scope and time range. You can run a log search that returns all records when you click See all at the bottom of the blade or when you click the blade header. Click an application name to run a log search for the application that shows application records per host, records by telemetry type, and all data by type (based on the last day). Click on a computer name to run a log search for the host that shows application records per host, records by telemetry type, and all data by type (based on the last day). Results show the number of passes and failures for all tests. It shows all Web Apps with traffic for the last minute. Click an application name to view a log search showing details of failed web tests. Server Requests – Requests per hour Shows a line chart of the server requests per hour for various applications. Hover over a line in the chart to see the top 3 applications receiving requests for a point in time. Also shows a list of the applications receiving requests and the number of requests for the selected period. Click the graph to run a log search for ApplicationInsights | where TelemetryType == "Request" | summarize AggregatedValue = sum(SampledCount) by ApplicationName, bin(TimeGenerated, 1h) that shows a more detailed line chart of the server requests per hour for various applications. Click an application in the list to run a log search for ApplicationInsights | where ApplicationName == "yourapplicationname" and TelemetryType == "Request" and iff(isnotnull(toint(RequestSuccess)), RequestSuccess == false, RequestSuccess == "false") == true that shows a list of requests, charts for requests over time and request duration and a list of request response codes. Failures – Failed requests per hour Shows a line chart of failed application requests per hour. Hover over the chart to see the top 3 applications with failed requests for a point in time. Also shows a list of applications with the number of failed requests for each. Click the chart to run a log search for ApplicationInsights | where TelemetryType == "Request" and iff(isnotnull(toint(RequestSuccess)), RequestSuccess == false, RequestSuccess == "false") == true | summarize AggregatedValue = sum(SampledCount) by ApplicationName, bin(TimeGenerated, 1h) that shows a more detailed line chart of failed application requests. Click an item in the list to run a log search for ApplicationInsights | where ApplicationName == "yourapplicationname" and TelemetryType == "Request" and iff(isnotnull(toint(RequestSuccess)), RequestSuccess == false, RequestSuccess == "false") == true that shows failed requests, charts for failed requests over time and request duration and a list of failed request response codes. Exceptions – Exceptions per hour Shows a line chart of exceptions per hour. 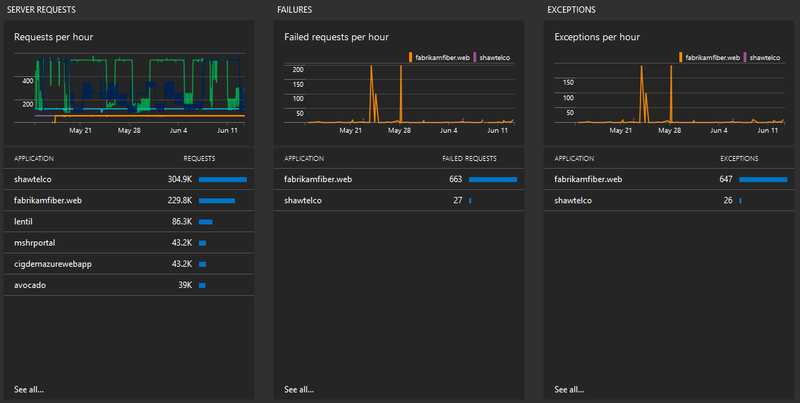 Hover over the chart to see the top 3 applications with exceptions for a point in time. Also shows a list of applications with the number of exceptions for each. Click the chart to run a log search for ApplicationInsights | where TelemetryType == "Exception" | summarize AggregatedValue = sum(SampledCount) by ApplicationName, bin(TimeGenerated, 1h) that shows a more detailed link chart of exceptions. Click an item in the list to run a log search for ApplicationInsights | where ApplicationName == "yourapplicationname" and TelemetryType == "Exception" that shows a list of exceptions, charts for exceptions over time and failed requests, and a list of exception types. When you click any item in the dashboard, you see an Application Insights perspective shown in search. The perspective provides an extended visualization, based on the telemetry type that selected. So, visualization content changes for different telemetry types. When you click anywhere in the Applications blade, you see the default Applications perspective. The perspective shows an overview of the application that you selected. The Availability blade shows a different perspective view where you can see web test results and related failed requests. When you click anywhere in the Server Requests or Failures blades, the perspective components change to give you a visualization that related to requests. When you click anywhere in the Exceptions blade, you see a visualization that's tailored to exceptions. 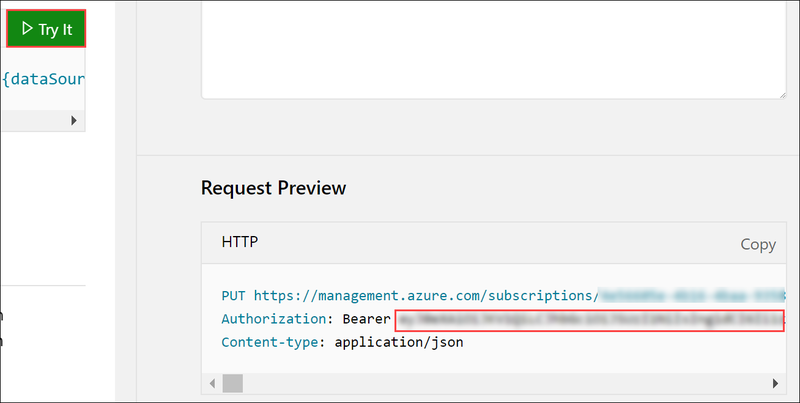 Application Insights Connector blades are designed to enable you to pivot to the selected Application Insights app when you use the Azure portal. You can use the solution as a high-level monitoring platform that helps you troubleshoot an app. When you see a potential problem in any of your connected applications, you can either drill into it in Log Analytics search or you can pivot directly to the Application Insights app. To pivot, click the ellipses (…) that appears at the end of each line, and select Open in Application Insights. 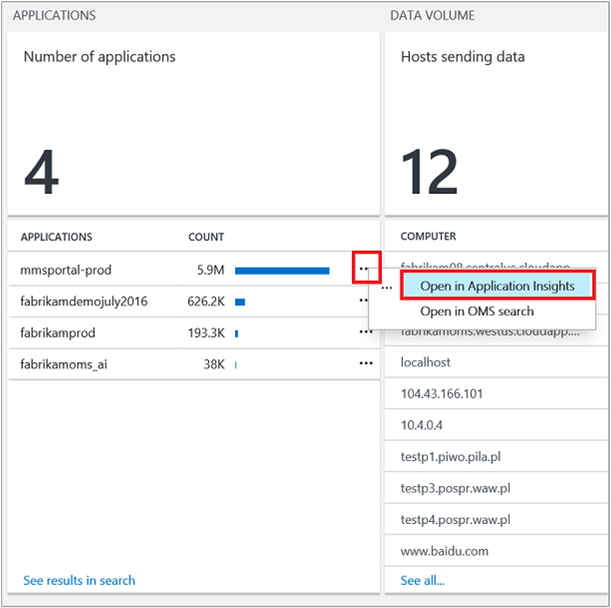 Open in Application Insights is not available in the Azure portal. Application Insights provides sampling correction to help reduce telemetry traffic. When you enable sampling on your Application Insights app, you get a reduced number of entries stored both in Application Insights and in Log Analytics. While data consistency is preserved in the Application Insights Connector page and perspectives, you should manually correct sampled data for your custom queries. The Sampled Count field is present in all entries and shows the number of data points that the entry represents. If you turn on sampling for your Application Insights app, Sampled Count is greater than 1. To count the actual number of entries that your application generates, sum the Sampled Count fields. Sampling affects only the total number of entries that your application generates. You don't need to correct sampling for metric fields like RequestDuration or AvailabilityDuration because those fields show the average for represented entries. Page views – For your workspace to receive page views, you must configure your apps to collect that information. Fore more information, see PageViews. Custom events – For your workspace to receive custom events, you must configure your apps to collect that information. Fore more information, see TrackEvent. Data is received by Log Analytics from Application Insights as it becomes available. SamplingRate Percentage of telemetry generated by the SDK that is sent to portal. Range 0.0-100.0. RequestSuccess Indicates success or failure. True or false. RequestDurationMin For sampled records, this field shows the minimum request duration (milliseconds) for the represented data points. This solution does not have a set of sample log searches shown on the dashboard. However, sample log search queries with descriptions are shown in the View Application Insights Connector information section. With OMS portal deprecation, there is no way to configure and remove existing connections from the portal. You can remove existing connections with the following PowerShell script. You must be the owner or contributor of the workspace and reader of Application Insights resource to perform this operation. $Subscription_app = "App Subscription Name"
$Subscription_workspace = "Workspace Subscription Name"
You can retrieve a list of applications using the following PowerShell script that invokes a REST API call. $AccessToken = "AAD Authentication Token"
This script requires a bearer authentication token for authentication against Azure Active Directory. One way to retrieve this token is using an article in the REST API documentation site. Click Try It and log into your Azure subscription. You can copy the bearer token from the Request Preview as shown in the following image. 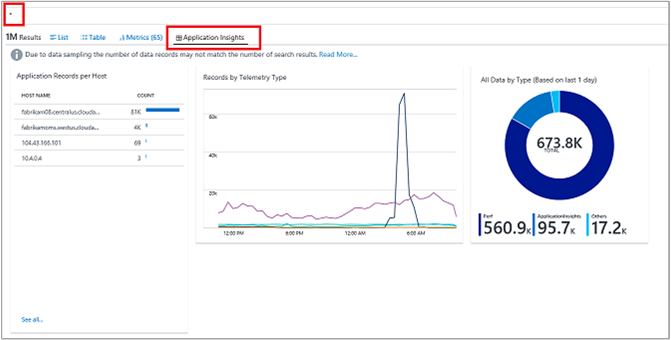 Use Log Search to view detailed information for your Application Insights apps.